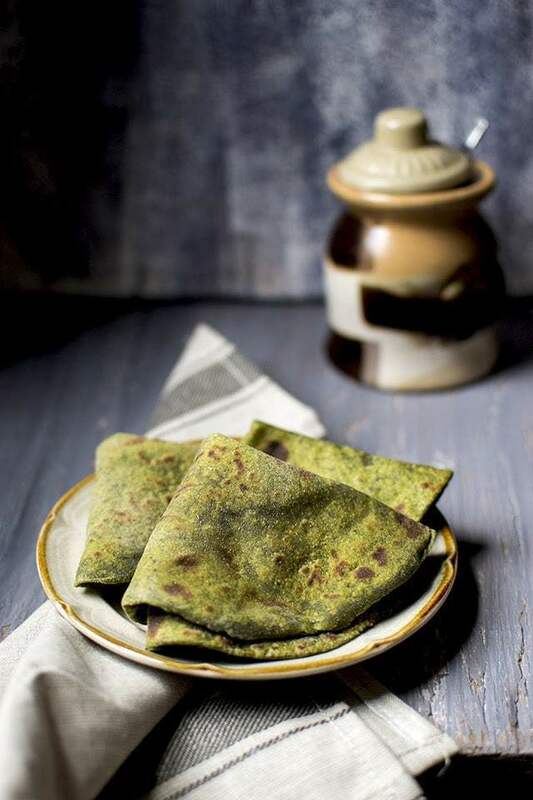 Healthy & nutritious rotis (flatbread) made with avocado and spinach. These rotis turn out super soft and delicious. Steam or boil or saute spinach until wilted. Grind to a paste along with the avocado and green chili. Combine the spinach paste, atta, garam masala, salt and oil in a mixing bowl. Mix and knead into a smooth, pliable dough. Cover and set aside for 15~20 minutes. Divide the dough into 6~8 equal pieces. Roll each piece into 6~7" rotis. Cook on a tawa on medium-high heat until brown spots form on both sides, about 1~2 minutes per side. Brush some ghee or vegan butter on the roti. Serve with raita and/ or pickle.